America’s multiracial population encompasses a multitude of racial combinations. But the largest share of multiracial adults by far – half – is non-Hispanic white and American Indian, a new Pew Research Center survey has found. Among the 1,555 multiracial adults surveyed, an additional 12% are non-Hispanic black and American Indian, while another 6% are non-Hispanic white, black and American Indian. Yet the same survey shows that many of these multiracial American Indian adults have few connections with Native Americans. For example, among biracial adults who are white and American Indian, only 22% say they have a lot in common with American Indians; 61% say they have a lot in common with whites. And only 19% say they have had a lot of contact with their relatives who are American Indian. In addition, biracial adults who are white and American Indian are among the least likely of mixed-race adults to consider themselves multiracial (only 25% do). They are among the most likely to say their multiracial background has been neither an advantage nor a disadvantage; 82% say it has not made a difference. 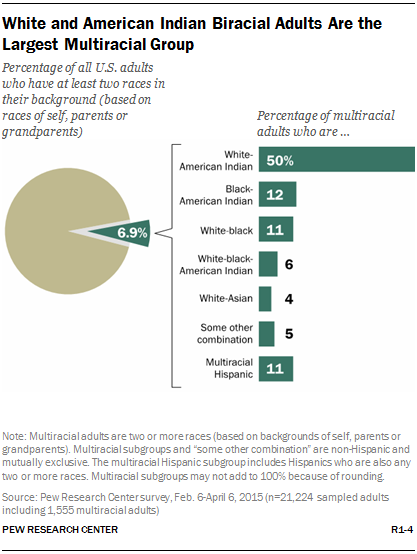 Like Pew Research Center, the U.S. Census Bureau found that the largest number of mixed-race adults describe their racial background as non-Hispanic white and American Indian: One-in-five multiracial adults (21%) checked that racial combination in the bureau’s 2013 American Community Survey. The Pew Research estimate of the multiracial population takes into account not just how people describe their own race but also how they describe the races of their parents and grandparents. Using this approach, some 6.9% of U.S. adults could be considered multiracial. The Census Bureau counts people as multiracial only if they self-identify as more than one race. According to census estimates, 2.1% of adults were multiracial in 2013. Since 1960 – when Americans were first allowed to choose their own racial identity on census forms rather than having enumerators do it for them – the American Indian population has grown more rapidly than could be explained by births or immigration. Recent growth has been sharpest among the population that is American Indian and at least one other race. What could explain the growth in the number of American Indians in census data? Some researchers cite the lessened stigma and increased pride about being an American Indian. Another factor could be changes to the census form that could have encouraged Hispanics to identify as American Indian. Much of the growth has been in urban areas or other places that are not on Indian lands. At the same time, the share of American Indians who report a tribal affiliation in census data has been falling. The percentage that does not provide a tribal connection is higher for multiracial American Indians than for single-race American Indians (37% vs. 24% in the 2010 census). There are now more than 500 federally recognized American Indian or Alaska Native nations that set their own criteria for membership. Although requirements differ, membership often is granted based on having proof of American Indian ancestry. Other data show that American Indians in the census are a group with fluid membership. Research by University of Minnesota sociologist Carolyn Liebler and two Census Bureau co-authors found that considerable numbers of people who identified as American Indian in the 2000 census did not do so in the 2010 census, or vice versa. This was especially true among those who identified as multiracial in one census or the other. The demographics of multiracial adults could change in the future, depending on how the youngest multiracial Americans identify their race when they grow up. While adults with an American Indian background are currently the largest multiracial group, census data on babies (whose race is chosen by their parents) show a different story. In 2013, only 11% of multiracial babies were white and American Indian. A majority of mixed-race babies were either biracial white and black (36%) or biracial white and Asian (24%).